Is It Normal for Bird to Hang Upside Down? First-time bird owners often become alarmed when they find their feathered friends spending time hanging upside down. This might be observed when your bird is sleeping, playing, eating, or drinking. The truth is, this is a normal and natural behavior for birds and should not be a cause for worry. It's frequently reported in healthy parakeets, parrots, and cockatiels. In fact, an upside-down bird can be a good sign. A bird that feels comfortable enough to assume this vulnerable stance is almost certainly a bird that is happy, healthy, and secure in the home. If you find your pet swinging or hanging upside down, you can pretty much assume that they are in a playful and content mood. If you feel like your pet is spending too much time upside down, consider whether they are behaving abnormally or having any signs of health problems. If things are otherwise normal, you might discuss it at your pet's next check-up, but if there are symptoms that something may be wrong, schedule an appointment with your avian vet to rule out any possible health concerns. Budgerigars, or budgies, are smallish green and yellow birds in the wild that are native to Australia and are commonly called parakeets in the U.S. 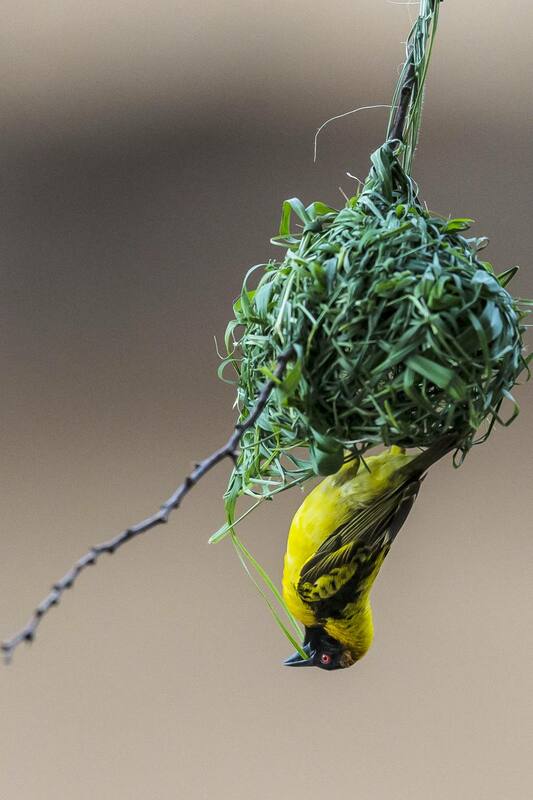 These birds are known for hanging around in all sorts of strange positions, including upside down. They have a gentle and funny personality that is enhanced by their acrobatic skills. They thrive in a large cage with several horizontal bars to do their gymnastic tricks. They are playful and like stimulation from their owner or another bird. They will certainly keep you entertained and trying to guess what they will do next. One theory as to why they may sleep upside-down is that they usually roost in high, hidden locations in the wild. Your parakeet might perch as high as possible in its cage and then hang down to sleep. Besides hanging upside down, they can also turn their heads 180 degrees, engage in large stretches and puff themselves up, often before taking a lunchtime nap. They often grind their beaks while they are sleeping. They can be taught to mimic speech, just like parrots. It's most common for parrots to sleep standing up on one foot with the other foot raised. At times you may see your parrot sleeping upside down, hanging upside down, or assuming that posture while playing. The African grey parrot has been reported by owners to be a species that likes the upside-down view. There are also several species of parrots native to Asia that prefer to sleep hanging upside down. These hanging parrot species are usually green short-tailed birds. Cockatiel owners also report that their birds will bend forward until they are upside-down and then spread their wings wide open in sort of a hanging bat pose. They observe that their birds usually seem happy at the time and it seems like a normal, harmless behavior.